Hematologist Peter Maslak is part of a multidisciplinary team highly experienced in caring for people with myelodysplastic syndromes. Myelodysplastic syndromes (MDSs) are a group of closely related disorders that arise in the bone marrow. They occur due to a disorder of the hematopoietic stem cells. These are the immature cells from which all blood cells develop. As a result of MDS, the bone marrow makes fewer red blood cells (which carry oxygen), white blood cells (which fight infection), or platelets (which prevent or stop bleeding), or any combination of the three. In MDS, the cells in the blood and bone marrow also usually look abnormal. “Myelo” refers to the cells in the blood and bone marrow. “Dysplastic” means abnormal. This is where the name myelodysplastic syndrome comes from. Between 15,000 and 20,000 people are diagnosed with MDS in the United States each year. The most common age at diagnosis is about 70, although people of any age can develop the disease. Therapy-related MDS is a subtype of MDS. It is caused by treatment with chemotherapy or radiation therapy for a previous cancer. In the United States, the number of new diagnoses of MDS and therapy-related MDS are both rising. This is because older people make up a growing segment of the population and people now live longer after treatment for cancer. In the past, MDS was commonly referred to as a preleukemic condition. That’s because some people with MDS later develop acute leukemia as a complication of the disease. It is still sometimes called preleukemia. However, most people with MDS will never develop acute leukemia. Hematopoietic stem cells are produced in the bone marrow. They mature into functioning blood cells there. MDS arises when one of these stem cells transforms from a normal cell into a cancer cell that is capable of uncontrolled growth. The cancer cell begins producing identical copies. These are sometimes referred to as dysplastic clones. The clones may be unable to make blood cells efficiently, or the blood cells that they produce may die early. As a result, people with MDS usually have low blood counts. As the number of healthy cells in the body declines, people with MDS may be prone to anemia. Anemia is caused by a lack of oxygen-carrying red blood cells. People with MDS may also get infections because they have fewer infection-fighting white blood cells. They may bruise and bleed due to a low level of platelets. In addition, the presence of abnormal blood cells can increase the likelihood of bleeding and infections. Over time, very immature bone marrow cells may increase in number. These are called called blasts. They can fill up the bone marrow so there isn’t room for the normal red and white blood cells and platelets that are produced there. This overgrowth of blasts, if severe enough, is called acute leukemia. 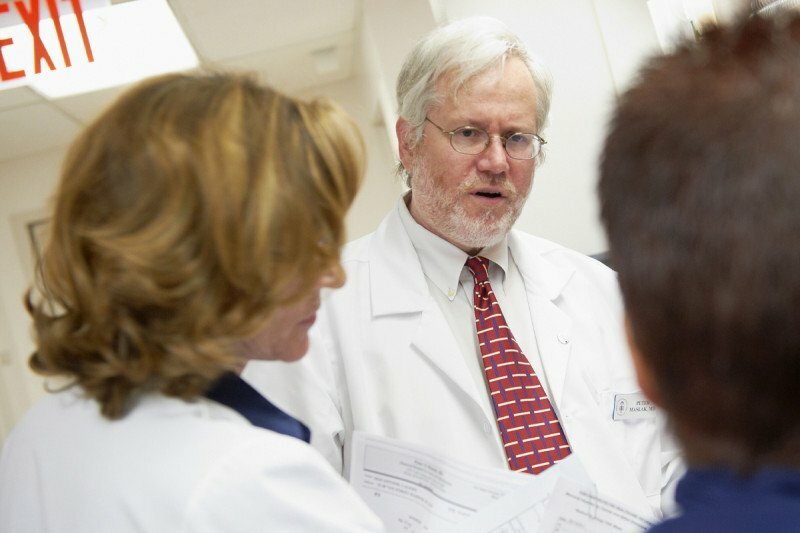 Memorial Sloan Kettering’s Hematology Disease Management Team provides comprehensive, multidisciplinary care. We care for more than 125 people newly diagnosed with MDS each year. Our MDS experts conduct clinical trials to evaluate the latest therapies. We lecture at major conferences and institutions around the world. In addition, MSK has been designated as a Center of Excellence by the Myelodysplastic Syndromes Foundation.